A visit to Tennessee's highly unusual experiment station. Take a quick look around and it’s obvious Ames Plantation resembles no experiment station you’ve ever run across. Truth is, Ames, located not far from the Mississippi state line in Grand Junction, Tennessee, is much more than an experiment station. To bird dog enthusiasts, it’s home to their national field trials. Foresters can inspect some of the nation’s most innovative hardwood research. Archeologists have several digs to study. Angus breeders can gaze upon the nation’s third-oldest herd. For historians, there’s plenty to marvel at. If antebellum structures strike your fancy, welcome to Ames. And if regular modern-day agricultural research interests you, Ames has that, too. Long history. The plantation as we see it now dates to 1901, when Hobart Ames, a wealthy Massachusetts factory owner, bought the land. He and his wife, Julia, spent extended periods here with a group of workers who traveled back and forth on the train with them. They grew cotton here, raised cattle, and hunted with a passion, using horses and dogs much like today’s hunters. Hobart Ames died in 1945. Julia Ames followed him in 1950. Her will created the Hobart Ames Foundation, directed to benefit the University of Tennessee and provide grounds and administration for the bird dog national field trial championships. Today, only 3% of Ames’ funding comes from the University of Tennessee. The rest is self-generating, from crops, cattle, forestry, and other efforts. The Stencil House at Ames’ Heritage Village. Rick Carlisle came to Ames in 1982 as an assistant manager. He was named center director in 2003. He knows just about every acre of the plantation and for three years has been a judge of the bird dog field trials championship. Only the best dogs compete at Ames. “There are 81 qualifying trials in the U.S. and Canada. A dog has to have two first place wins in any qualifying event anytime in his life. Then he’s qualified to run that year in the championship. To re-qualify, he has to place in any qualifying event. This is the Super Bowl, the World Series, for bird dogs. Most of the dogs here are English pointers and setters. They’re the only ones that run hard enough. They ran a half mile to two miles from the horse. They key on that horse and take verbal directions and hand signals,” Carlisle says. The dogs range over about 6,000 acres searching for 300 coveys of quail. The field trials’ roots go back to a gentlemanly gathering in West Point, Mississippi, in 1895. In 1905, Ames Plantation hosted the championship. Hobart Ames’ dog won, generating much criticism. After his dogs placed in the event three more times, Hobart Ames never competed in it again. 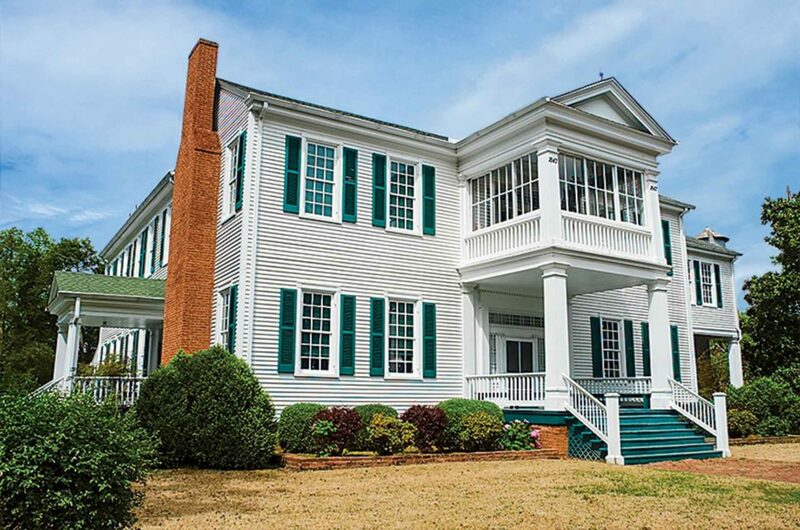 Ames Plantation became the event’s permanent home in 1915. In addition, it hosts four other smaller-scale field trials annually. “Ames brings out the best in a good dog. Each course is 11-1/2 miles in linear length. The dog runs 22 to 26 miles in a three-hour period. That dog has to be in perfect shape. As a judge, I look for a dog that will complete his three hours with almost as much enthusiasm and energy as he started with,” Carlisle says. High dollar dogs. Campaigning a dog through the various qualifying events can easily cost $20,000 a year, Carlisle figures. Getting a dog named champion on that second Monday in February can bring in high dollar stud fees, helping out considerably. In 2016, 49 dogs from 24 handlers qualified for the National. A three-year-old pointer named Whippoorwill Justified won. Owned by Ronnie Spears and trained by Larry Huffman, it was the first appearance at Ames for the dog, called Patch because of his distinctive marking. Ames’ many-roomed Manor House dates to 1847. Extensive restoration efforts keep it looking good many years after Hobart and Julia Ames died. Huffman won in 2008 with a dog named Whippoorwill Wild Agin, and in 1999 with a dog named Whippoorwill Wild Card. He trains dogs at Whippoorwill Farm about eight miles up the road from Ames Plantation. Bird dog royalty may get the headlines here some of the time but Ames by no means has gone completely to the dogs. On any given day a visitor may encounter agricultural and forestry researchers from several universities, archeologists fresh from a dig far from any road, historians searching for clues to the region’s antebellum past, Civil War re-enactors, hunters, and fishermen. Allan Houston, the plantation’s forester and wildlife manager, likes to show off methods used to reallocate growth and improve the genetic base of hardwood trees at Ames. High quality trees get selected for improvement with fertilizer. Trees nearby are cut, releasing the selected ones from the canopy. Ames has an area called the orchard, with 22 species of hardwoods planted in rows. A University of Tennessee plant geneticist harvests nuts, grows them out in controlled conditions, grades saplings, and brings the very best hardwood offspring back to Ames. “This is precision forestry, where we connect species to the site, to certain fertilizer and release regimes. We use satellite imagery to measure these trees to the nearest centimeter. We could monitor their growth from space. It’s all cutting edge stuff,” Houston says. 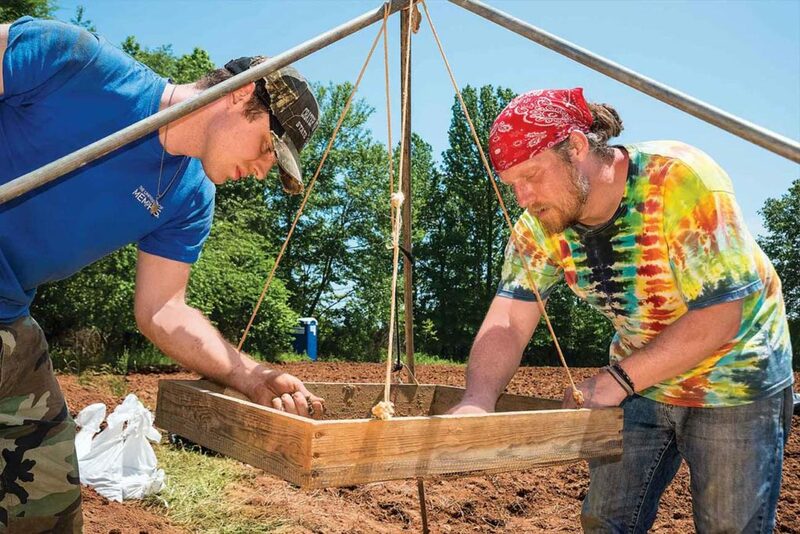 Venture along dirt tracks through the fields, pastures and woodlands and, if you’re here on the right day, you’ll come across teams of archeologists and their students from the University of Memphis and Rhodes College. University of Memphis archeology students sift soil looking for pottery shards. The group from Rhodes excavates sites to more fully understand the lives of slaves who lived on the ten pre-Civil War cotton plantations that later became Ames property. University of Memphis archeologists are interested in the native Mississippian culture associated with four mounds along the Wolf River dating as far back as the 12th century A.D. They’ve found evidence of agriculture supplying the villages at the mound site, making Hobart Ames just the most recent farmer in hundreds of years of growing crops here. 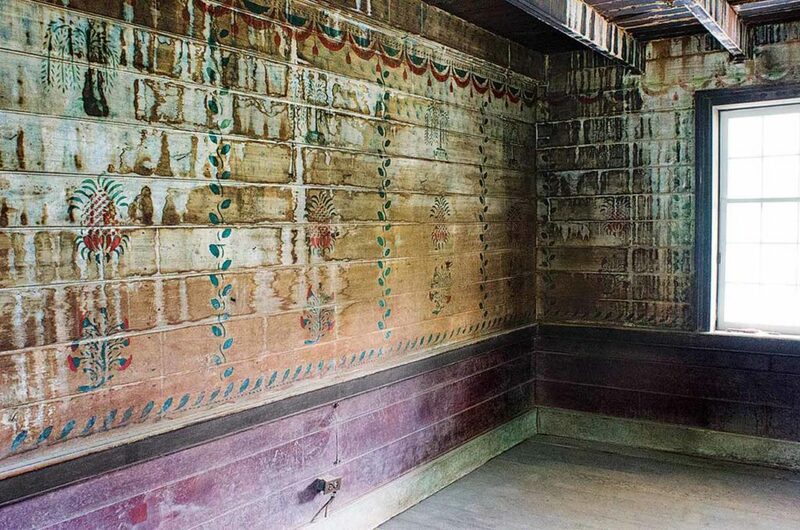 “This is a tremendous laboratory for historical archeology. The village sites, the Native American house sites on farms around the village, the old plantation sites that are no longer standing, still hold information about the history of the land,” Jamie Evans says. New packaging material helps tell a sustainability story.